The best action sequence in the film finds Henry and Marcus Brody (Denholm Elliott) in the belly of a German tank and Indy outside on horseback trying to get them free. Indy incapacitates the vehicle enough to get its commander to open the upper hatch. The two men grapple with each other while Marcus and Henry make their escape. The tank barrels toward a gorge cliff face. Indy discovers this at the last second. Does he make it off alive? The best part of the scene is when Henry, Sallah and Marcus peer over the edge of the cliff after the tank has plummeted to its fiery doom looking for Indy. There is a moment where they all look sullen, then Indy shows up and peers over the edge as well wondering what the other three are looking at. Another great moment of humor from the film as Henry discovers his son is alive and embraces him warmly. Indy’s hat also blows into frame at the end of the scene completing the moment perfectly. The climactic scene from “Temple of Doom” finds Indy, Willie and Shorty making their escape on a cliffside when they encounter a rickety wooden rope bridge high above the alligator filled water below. Once across the bridge, Willie and Shorty are caught by Mola Ram (Amrish Puri) and the other baddies and are forced to go back and join Indy who is now surrounded by goons. The only way Indy figures they have a chance for survival is to cut the rope suspending the bridge and take their chances. He cuts the binding and everyone panics. Several men fall to their deaths and get chewed by the gators. 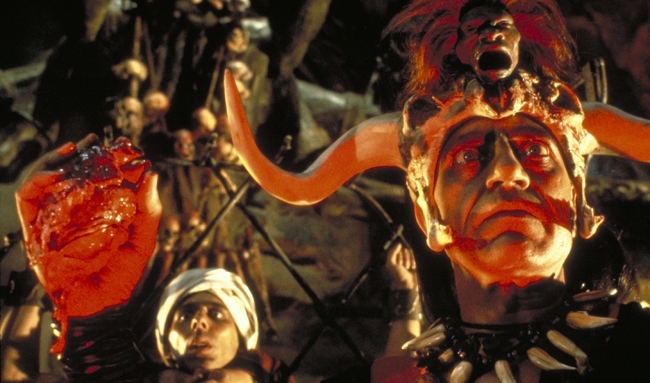 Indy and Mola Ram engage in a power struggle not only for the Sankara Stones, but for life itself. The entire sequence is tension-filled and keeps us wondering what is going to happen next. When Indy is hanging around fighting for his life, you watch with concern as Mola Ram attempts his heart removal trick he performed earlier in the film. 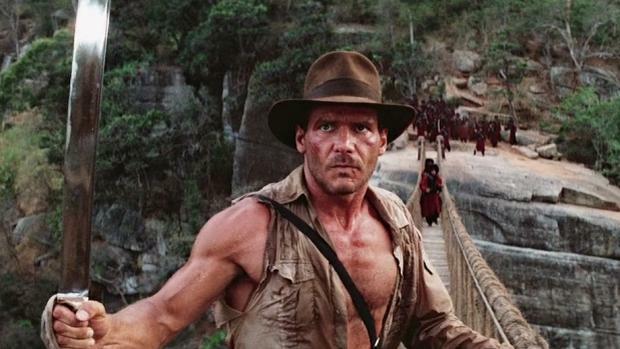 Indy’s fate is finally revealed when you see his arms crawl up on the bridge remnants. You can then breathe a sigh of relief (not there was any doubt Indy would prevail). Spielberg shoots the scene from many angles, side to side, above and below giving us even more sense of intrigue and complexity. 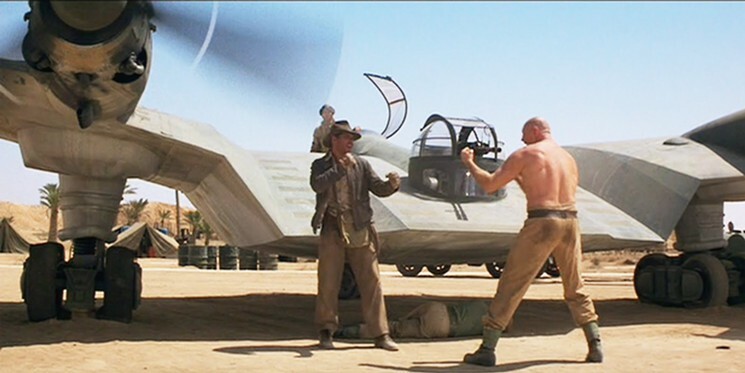 After escaping from “The Well of the Souls”, Indy discovers his potential means of escape in a plane parked on a desert airfield. While attempting to dispense of the Nazi guards, he alerts the bald, mammoth brut soldier who relishes the idea of a fight. He yells at Indy and Indy reluctantly relinquishes knowing he cannot avoid the brawl. As their confrontation begins, Indy receives one punch from the goliath that knocks him to the ground. He quickly realizes he is overmatched. Also, Marion (Karen Allen) gets locked in the cockpit of the plane herself trying to subdue another soldier. The plane is now slowly spinning in place making the brawl even more difficult. The sequence is amazing in intensity and having several crucial events happening simultaneously. You can see Indy’s fear growing especially when the brut has been splattered and Indy knows he must free Marion before the plane explodes. Also, the cut from the propeller to the blood splatter on the tail of the plane worked well to convey the message of doom. After the bad guys are dispensed and the Holy Grail is lost, our heroes narrowly escape defeat and exit the rocky structure which crumbled all around them. Sallah inquires why Henry calls Indy “Junior”. Henry replies Indy’s name is actually “Henry Jones Jr.” and “Indiana” is actually the name of their family dog. With that, the foursome ride into the sunset completing the original trilogy. What makes it great is we, as the audience, are finally let in on the running joke which had been going the entire film as far as “Junior” and the entire trilogy as far as “Indiana”. All of us enjoy knowing this information and it wraps up the story nicely. You can tell Spielberg really meant to have this be the final story as the shots of the sunset and the actors riding toward it really make you feel Indy’s adventures are over for good. While escaping the bad guys in the Cairo marketplace, Indy and Marion gets separated. Marion takes refuge in a wicker basket only to be discovered by the Nazis when her position is given away by a tattletale monkey. Indy searches for Marion without success. Suddenly, the crowd parts like the Red Sea revealing a tall massive Arab Swordsman (Terry Richards). He shows off his prowess with a blade. Indy is unimpressed and shoots him dead in the street. The scene is great not only because it is hilarious and completely unexpected, but also because it breaks the tension of Indy’s search for Marion. The scene itself was not in the script for the film and was suggested by Harrison Ford himself who was originally supposed to whip the sword out of the swordsman’s hand. The look on Ford’s face as he realizes he can dispatch this assassin quickly and with very little effort is priceless. The change made the scene unforgettable. The Ark of the Covenant is loaded on a truck full of Nazis as they prepare a convoy to transport it to Cairo. Indy quickly follows on horseback in an attempt to procure it for himself. He jumps from his horse and dispatches the drivers of the truck. He takes care of a few of the other perusing vehicles so he is now in command. The soldiers in the back of the truck decide to try and retake it. One of the soldiers manages to shoot Indy and they struggle and fight in the cab for control. Indy is thrust out of the truck onto the front grill where he climbs down under the vehicle. He hooks his whip and is dragged behind. He eventually takes back control of the truck and manages to escape with the Ark intact. One of the most intense car chase, fast paced action scenes of all time, the entire sequence is breathtaking in its intensity and action. You know Indy is outnumbered and can’t wait to see what he will do next in order to dispatch his enemies and survive. As with the rest of the film, the score from film maestro, John Williams, is thunderous and adds exponentially to the fervor. After finding their way inside a secret passageway in Willie’s luxurious palace suite, Indy, Willie and Shorty bear witness to an intense sequence involving a human sacrifice of the Thugee cult. The cult had been said to have been extinct. The gathering proves otherwise. The victim is locked into a steel cage presided over by cult leader Mola Ram. Ram prays to his God, Kali, then inserts his hand into the man’s chest removing his still beating pulmonary organ and displays it for the chanting crowd. The heart bursts into flame as the man, who is still alive, is lowered to the fiery depths below. The scene is consuming as we have never seen anything like the heart removal before. It really takes the audience by surprise. It was scenes like this one which prompted this film to be one of the first movies to prompt creation of the PG-13 rating. Although rated PG, the seen was criticized for being too intense for younger viewers.